Ferrets have high metabolic rates -very short digestive tract -and therefore need feeding little and often. It’s a good idea to have food available all day long – perhaps hiding it to stimulate their natural foraging behavior. Ferrets cannot easily digest large amounts of fibre or complex carbohydrates so avoid bread and cereals. The average ferret will eat 5-7% of its body weight on a daily basis - this is about 50-75 grams of food for a ferret weighing 1 kg. However, the quantity of food differs from animal to animal and according to life stage. Ferrets will require larger quantities during growth, gestation and reproduction. A reproducing female require a minimum of 30% protein in their diet and kits require more protein and fat. 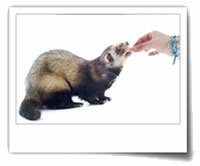 Older ferrets may need less food and of course if you think your pet is gaining weight, feed levels should be adjusted. It’s also important to only give your ferret small amounts of treats. If ferrets eat too much and become overweight, this can lead to many other health problems. 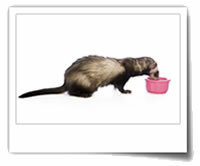 It is not advisable to make any sudden changes to your Ferret’s diet as this may make them very ill. Always introduce new diets gradually and talk to your vet it your ferret is ill.
Fresh, clean water must always be available and check it regularly – at least twice a day. If your ferret is outdoors in winter make sure the water doesn’t freeze. There are a number of foods that are poisonous to ferrets so always double check before you feed them. DO NOT FEED your ferret raisins, avocado and chocolate. The list is not exhaustive, and if in doubt as to whether something is safe to feed it is best to avoid. There are a number of nutritionally balanced diets for ferrets on the market. Manufacturers have experts available to provide you with advice on what you should buy for your ferret and how to feed, so contact them direct for further advice on specific products. A list of PFMA members who produce pet food for small furries can be found here.